In the morning, I often have the Today Show on; they usually have good food segments. Joy Bauer is their nutritionist, and she has some creative healthy twists. French toast is one of my favorite breakfast dishes, but I don’t make it very often. Her twist on French toast with sweet potatoes was different, and since I was craving French toast, it seemed worth a try! 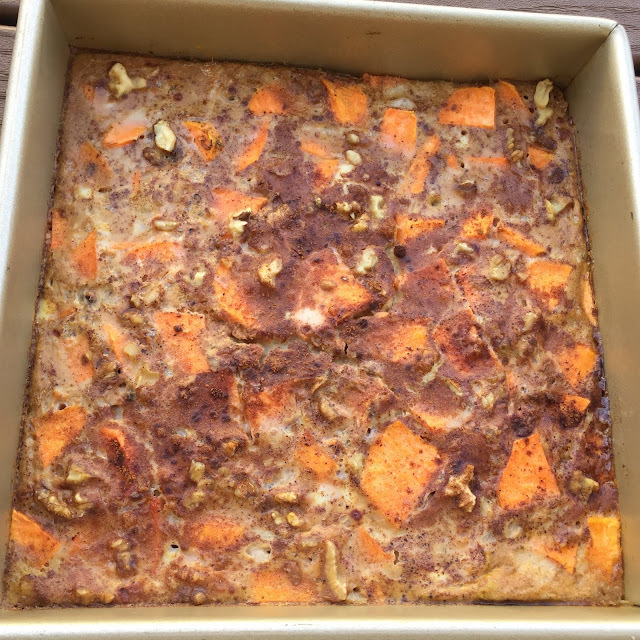 Sweet potatoes have a first bake, and then a variant on the traditional egg-milk soak with pumpkin is added to the sweet potatoes. The pan goes back in the oven. When it’s done, you have a twist on a French toast casserole! I don’t like pumpkin, but the pumpkin flavor was very mild. This was a filling and yummy breakfast to start the day - eggs for protein, sweet potatoes for veggies, and pumpkin for added fiber. Win, win! Preheat oven to 350˚. Place sweet potatoes in 9-inch x 13-inch baking pan and cook for about 25 minutes until soft. Remove from oven and leave in pan. In a large bowl, whisk together eggs, egg whites, almond milk, vanilla, pumpkin puree, honey, pumpkin pie spice, and 1 tablespoon of maple syrup until well combined. Pour over sweet potato in pan and push down with a spatula until the potato cubes are all soaked and mostly covered. Top with remaining maple syrup, additional pumpkin pie spice, and nuts. Bake for 35 to 45 minutes or golden brown and firm. Serve immediately. Store leftovers in the refrigerator covered for up to a couple days.